The idea is simple - I go into any DAW (this time it was LMMS) and make several very short pieces. Then put them into a gapless player and randomize the playlist. What is the gapless player on Linux? Yep, Aqualung. 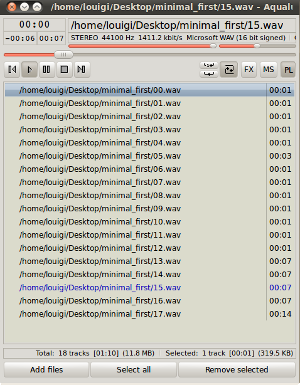 Of course what you'll hear, in case you'd want to waste time and bandwidth to get it, is just a proof of concept. I did not put any special effort into making the tune enjoyable, although it could be, provided your consciousness is in what doctors reffer to as the special state. Anyway, that one can in theory create a very sophisticated sound composition using gapless player like Aqualung is obvious. I do plan to play around more with this and I encourage other musicians who like to experiment to try this as well. As soon as I've posted this to the linux audio mailing list, instantly the question was asked - why didn't I do it with Pd? And a week later Cody Loyd already submitted a patch that does the same thing. His reasoning is that by using Pd one can eventually get more flexibility - an argument I fully agree with. So here is his patch. Works when saved in the same directory as your files which should be named '1.wav', '2.wav', '3.wav' etc. The random at the top in the patch should be given the same number as clips you have saved.